Why and when do investors buy an annuity? How much do they invest, and in what types of annuities? Answers to these simple questions can give advisors and other financial professionals a clear understanding of how they can find their best clients and grow their annuity business. LIMRA Secure Retirement Institute’s 2017 Annuity Buyers Metrics study shows that although annuities are called by different names, their core values matter most, and they attract buyers with similar investment objectives. When we connected the investment objectives of a particular type of annuity to its buyers, we began to see a simple pattern — annuities appeal to pre-retirees and retirees by addressing three major investment needs: accumulate, preserve the principal and receive predictable retirement income. By understanding the trends between buyers, their investment needs and the annuities they are purchasing, advisors and other financial professionals will be best equipped to address retirees’ and pre-retirees’ specific goals. The annuity industry is full of a confusing array of acronyms and technical jargon. However, by looking at buyer profiles, it is clear that buyers are attracted to the key underlying value proposition of an annuity, despite its name. 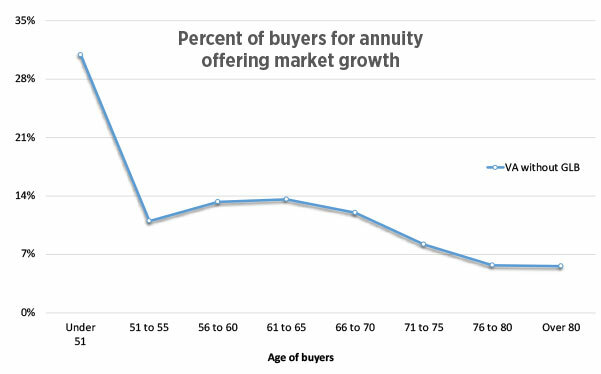 When more than one annuity type offers the same core investment objectives, the annuity types attract buyers from the same age groups in almost the same proportions. 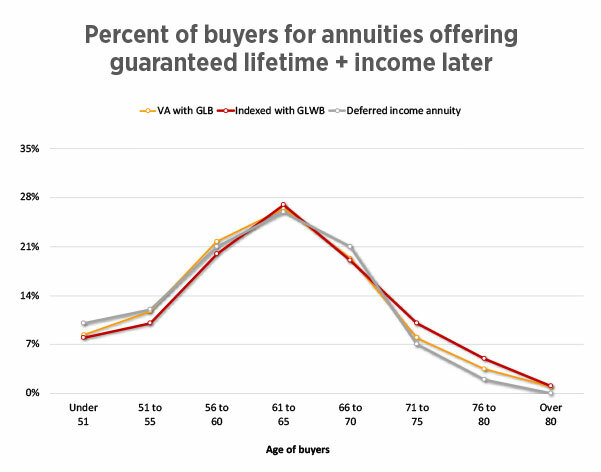 For example, a variable annuity (VA) with GLBs (Guaranteed Lifetime Withdrawal or Income Benefit), an indexed annuity with a GLWB (Guaranteed Lifetime Withdrawal Benefit) and a deferred income annuity (DIA) offer guaranteed lifetime income for later use as the core value and are different mostly in terms of their risk-return-flexibility trade-off in income or return on investments. 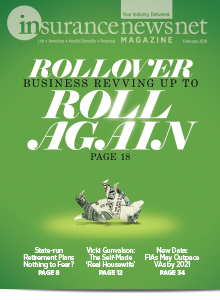 Nearly 60 percent of buyers are from two age groups — age 56 to 65 — near or at retirement. 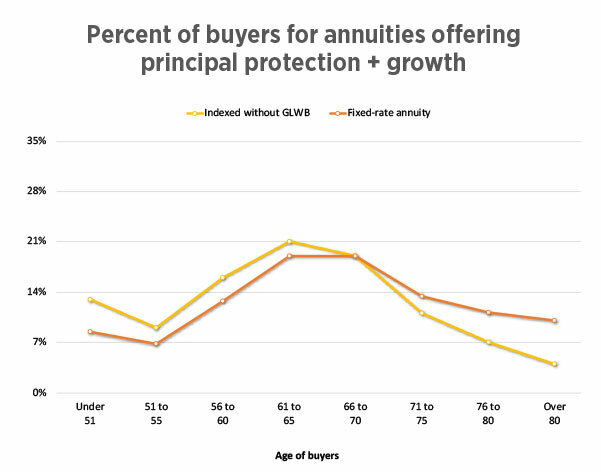 In a similar way, the proportion of buyers from different age groups does not vary for fixed-rate deferred annuities and indexed annuities without a GLWB — both types of annuities offering protected growth as their core value. Therefore, investment goals determine what annuities are suitable for whom. A VA without a GLB is suitable for investors looking for long-term, tax-deferred growth of their investments. As the tax-deferral benefit can be appealing to all investors of all ages, there is no particular age group more inclined to buy these annuities. 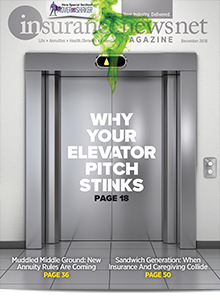 As such, VAs without GLBs attract buyers from all age groups quite evenly — remaining within a close range, the lowest at 6 percent to the highest at 14 percent. It is not to say that the multiple annuity types addressing a particular investment objective do not differ from each other. They do; they vary in terms of mechanics — how passively or actively they are managed, the degree of risks assumed by buyers and insurance companies, the choices of investment options, degree of control, fees, etc. However, to a prospective annuity investor, annuity types differ mostly in terms of risk-return-flexibility trade-off. 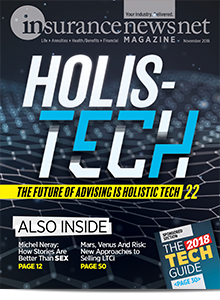 Advisors will do better to use plain language with their clients in explaining annuities, focus on clients’ retirement goals and see how annuities can address their clients’ particular concerns. Average premiums for annuities guaranteeing lifetime income are quite attractive — nearly 50 percent higher than other types of annuities. For example, buyers invest on average around $150,000 in single- premium immediate annuities (SPIAs), DIAs and VAs with a GLB. After investing in a home, annuities are arguably the second-largest purchase people make in their lifetimes. 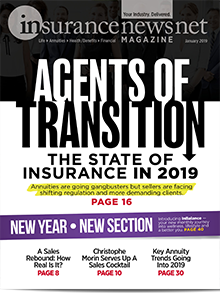 Annuities serving the principal protection market — fixed-rate annuities and indexed annuities without a GLB — draw similar average premium sizes, ranging from $89,000 to $95,000. Investors buy these guaranteed-income annuities at or in retirement, when many investors are at the peak of their earnings or accumulated assets. Mass-affluent and affluent households typically purchase these annuities. A recent LIMRA Secure Retirement Institute study of retirees shows that 80 percent of retired households (with at least an annual income of $35,000) that own an annuity have more than $100,000 in investable assets. 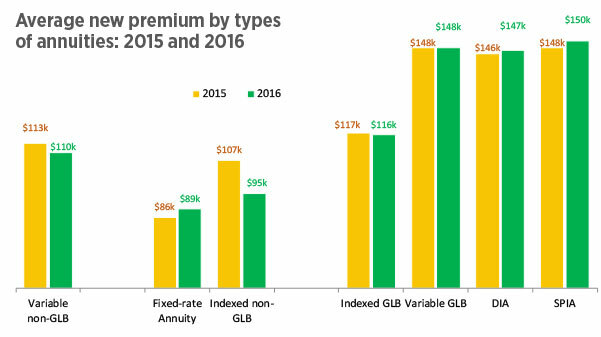 Comparison of average premiums and buyers between 2015 and 2016 in different types of annuities shows little impact from the DOL fiduciary rule turmoil during 2016. Essentially, the average premium sizes in different types of annuities remain largely stable. Of course, DOL-related confusion caused some distribution channels and their advisors to regress from annuities in general. As a result, principal protection products such as fixed-rate annuities and indexed annuities without a GLWB received 35 percent of total new sales of $168.3 billion in 2016 (13 percent higher than in 2015). 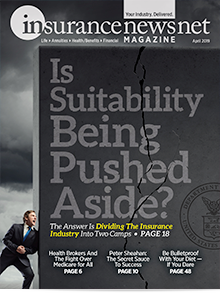 New premiums received in annuities offering guaranteed income for later use declined 16 percent from $89.8 billion in 2015 to $75.3 billion in 2016. However, the steady premium sizes point out that the advisors who continued to sell annuities did as well in 2016 as they did in 2015. Annuities can address investors’ different investment goals. However, annuities, as a retirement solution, must address the investors’ specific goals. Once the advisors know what their clients’ retirement and investment objectives are, it is easy to find the right annuity and fit it in the client’s portfolio. 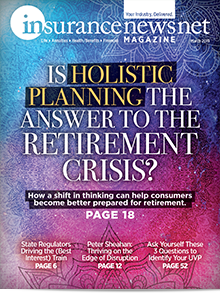 A formal retirement planning process can help advisors understand their clients’ concerns, challenges and goals. As more advisors complete a retirement income plan for their clients, there will be more opportunities to present annuities to serve their clients’ needs. Note: LIMRA Secure Retirement Institute’s 2017 Annuity Buyers Metrics study included retail annuity sales of 50 companies in 2016, thus representing $134.7 billion and 1.17 million contracts that covered 80 percent of the market. Todd Giesing is director, annuity research, LIMRA Secure Retirement Institute. Todd may be contacted at [email protected] .